I have seen a lot of nail enhancement "bashing" (maybe not quite bashing, but definitely no love) lately, and I think it's a little unfair. Acrylics and gels and other forms of nail enhancements seem to have such a bad reputation for ruining your nails, and that's understandable, as your average nail tech usually does ruin your nails. It's not the enhancement's fault- it's the lazy nail tech. Acrylics can actually be very good for your nails. It keeps them protected and helps them grow without fear of breakage or staining. I don't know if any of you saw my post on Makeup Alley a couple weeks ago about making finger soup, but I had a little accident with my left index fingernail. I was using one of these handy utensils to cut vegetables over a giant pot of vegetable soup. It was a wedding gift and I recently fell in love with it. It was so handy! You didn't need a cutting board at all, just like food scissors! Anyway, I was cutting carrots when all of a sudden something caused my hand to slip and SNIP!! I take a giant chunk out of my nail, nearly cutting off my finger. It cut down so far that the nail bed was exposed with only a thin layer of nail to keep me from bleeding all over. It was terrifying! And no, the nail didn't go into the soup- it flew across the kitchen and oddly enough, landed in the sink. So, now I had a nail that was so short I couldn't file it down to even it out, it hurt and was on the verge of bleeding. What was I to do? Have a sharp, jagged, painful monster nail until it grew out? No way! This is where acrylics save the day. I used some clear acrylic and a tip to make myself a new fingernail until my real nail grew out enough to file. It was clear in real life, for some reason it looks really cloudy in these pictures. It was only a tiny bit thicker than my natural nail, and you would never know it was fake unless I told you. Not huge and thick, but thin, clear and natural looking. And remember how I said a few posts back that I was having trouble with China Glaze? I'm wearing Passion In The Pacific on my nails in this picture. It's only about, say, 14 hours old in these pictures and look how damaged it is! It never fully dried, and I was chipping and denting it despite being very careful. Back on topic. I don't do acrylics often (I really hate the way they feel- you can't scratch with them!! I really don't need them, my natural nails are very nice!) but sometimes I find myself needing one to repair a broken-down-too-far-to-file nail. I know that when I remove the acrylic nail, my natural nail will be in the same good condition as it was before I applied the acrylic. In fact, it may be in even better condition because it won't be stained by polish, it won't chip or break and it may even be a little stronger from the weight of the acrylic. My natural nail had finally grown out enough to file down the jagged edges without making myself bleed, so I removed the acrylic yesterday. It came right off with a little acetone- about 30 seconds and it was gone! And underneath? My nail was smooth, strong, shiny and not one bit stained like my other nails. The myth is that acrylics will severely damage your natural nail. 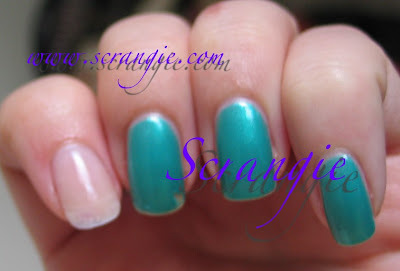 What really damages your natural nail is a nail tech filing and drilling the hell out of it with an e-file, or YOU damage your natural nail by biting or peeling off the acrylic instead of removing it the right way (soaking). Acrylics aren't evil- they're really not! They're great for repairs, or just to wear. If you can't get any length on your natural nails but want long nails, acrylics can do that. Or, maybe you want a french manicure that never chips? Acrylics. Maybe you want some really wacky, over-the-top nail art? Acrylics! Hopefully I've helped to remove some of the stigma surrounding acrylic nails. You totally changed the way I look at acrylics now. I've never tried acrylics or gel because I thought they'd ruined my natural nails. But thanks to your blog, now I know that acrylics can save the day if I broke my nails in the future. I'd rather do them myself though as I'm afraid I'd end up with a lazy nail tech, but I don't know how. Do you apply them just like you apply nail polish? Would appreciate if you could give newbies like me some sort of tutorial. What brand would you recommend, and can they be removed using normal polish remover? I don't have access to pure acetone here. Oh, cool! I'm one of those who always thought it was the glue or whatever that ruined the natural nails when using acrylics. Not that I actually need acrylics or want to pay as much as it costs here in Sweden to get them done, but you made it interesting all of a sudden! I agree with TK in the previous comment that a tutorial would be really nice. Maybe I'll try it some day if I break a nail! Is it difficult to do on yourself? That utensil looked very cool by the way! Sorry Scrangie you can turn me to "evil" side. :P Of course my dislike comes from people using the grinder tool on my natural nails to make the acrylic stick. *shudders* Evil people I tell you!!! ITA, a s&*t load of damage comes from not soaking them and ripping the suckers off! Ouch! I had acrylics for years and eventually I taught myself to do them. I loved the look and I sometimes miss them. But, I don't miss the smell and I feel really proud when people say my natural nails are beautiful. If I had longer nails, and broke one, I would absolutely resort to an enhancement as opposed to cutting the other 9 down. Great post, Scrangie. I keep my nails filed quite short, almost below my fingertips - I have long nail beds and they're very detached, so I can get away with it - but if I had longer nails and one broke I'd absolutely get an acrylic put over the top. It's actually my dream to get big, over the top acrylics when I graduate with my PhD. Any tips on how to find these non-masochistic nail techs? scrangie thanks for posting this. until reading the nail board on MUA i never knew that the techs weren't suppose to use that drill. I had fakes for years because i was a biter and dreaded taking them off because of the mess my nails would be. i wish i could do my own but i'm not coordinated enough. Thanks for this post, and for swatching Passion in the Pacific! Wow, that color is just brutal!!! doesn't acrylic make your nail bed look 'fatter' ? I had acrylics for many years. I used to get them removed every year and get a new full set and then sometimes I would go months without acrylics at all. I never had any problems with them and my natural nails were never damaged from them. I no longer have them because I don't have time to maintain them & the nailtech I used to go to have moved far away. It's nice to see and read that another person also has a healthy attitude toward acrylics. Thank you for posting this. And might I say that your handiwork is amazing! Amen Scrangie! I'm so sick of all the acrylic bashing. I have them and I love them. Lina-Elvira, I can't trust anyone but myself to do my nails :) And those stick on nails can be quite scary! TK, thank you, I'm glad I was able to help! I won't lie, applying acrylics isn't 'easy'- it takes a lot of practice to get them to look nice and to sculpt nails that won't lift or crack. However, it's not impossible- it just takes patience. SiennaX, awesome! I bet they looked great. I agree about the smell- it's the one thing I hate the most about doing them. I've gotten used to it, but it's so strong I wonder if my neighbors can smell it? Rach, awesome! I'd love to see the big, over-the-top acrylics (I love them!). One way to find a good nail tech is to look around the salon- is it clean? Well-lit, well decorated, relaxing? A cared for salon environment is a sign that they don't rush and they take care of the little things. Usually when you walk into a "nail salon" you see rows and rows of nail tables and booths, sometimes with five or more nail 'techs' wearing masks, yelling across the room in a foreign language and filing away with a drill, like a nail assembly line or something! That's what you want to avoid. Jsnack, yes, thank you! Flaunt those lovely acrylics and wear them with pride! They're a work of art! And I have the same drying issues with Passion In The Pacific. I love the color but I can't wear it because it NEVER dries! So I frankened with it. I have acylics and my own nails are to weak. I work as a costume designer and work alot with fabrics. Fabrics are like sandpaper on your hands and nails and I really wont to have long nails so the only solution is acrylics then. I was speaking with a exhibitor at a beauty expo I went to on the weekend, and you are totally correct. Lazy nail techs that drill the nail down so that it is so flimsy make it almost impossible to not have acrylics. It seems to come down to money - they can see more clients if they drill rather than buff the shine off, without any consideration to the clients nails. I remember coming away with burn marks on my fingers and bleeding cuticles because they just dont pay enough attention. Wow, my experience with acrylics has permanently turned me off. My own natural nails are really good and I only wore acrylics out of laziness. I had them off/on for several years. But when it was time to take them off, the problems began. Either me or the nail tech took them off but forget soaking them for only 30 seconds. Try 30+ minutes or more. Then slowly rubbing or trying to file off the disintegrating acrylic, do that over again several times. By the time the acrylic was gone the nails were almost too!! I have yet to have had a good acrylic removal experience and I've gone to many different salons. So I've given up. I won't even use them for a repair. I have been sorely tempted over the years to do acrylic repair myself as I do manicures for friends and family and am very good with nail tools but just don't want to go there....sigh.....any suggestions for trying it on my own?